These tables stand on solid maple trestles, with hefty granite tops, which we use for sharpening purposes, but they are sturdy and handsome enough to put to many other uses at home or in the kitchen. Polished Maine granite top is 2" thick and milled flat to .001" in 6". 24" deep x 30" wide, custom height. Weight is approx. 220 lbs. 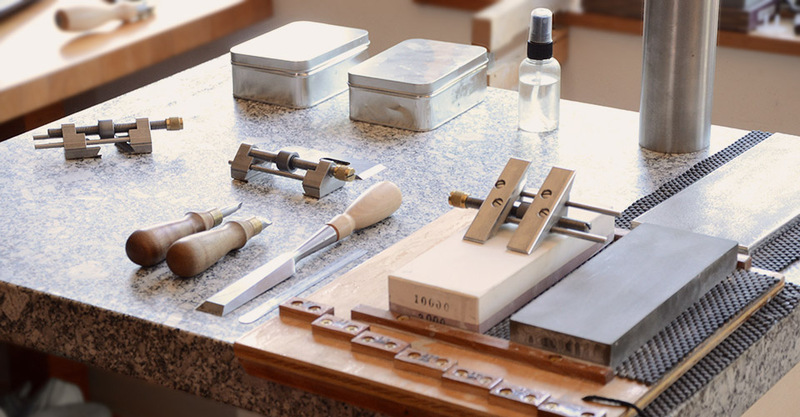 Most Sharpening Stations are slightly taller than your average workbench height, approximately 36" (91.44cm) high. We can customize the height of a Sharpening Station between 32" (81.28cm) to 38" (96.52cm) high. Even the best tools are little use with a dull cutting edge. While experts often debate over the best sharpening practices and equipment, we recommend a simple, reliable method that produces a razor edge in minutes. Our Sharpening Instructions PDF, offers a detailed guide that will help you learn this method. To view a video on our sharpening technique, visit our YouTube channel here. Deneb Puchalski's Angle Setting Jig is a great tool for setting the correct projection of blades and chisels in a honing guide. This Angle Setting Jig PDF offers plans and material suggestions so you can assemble your own. 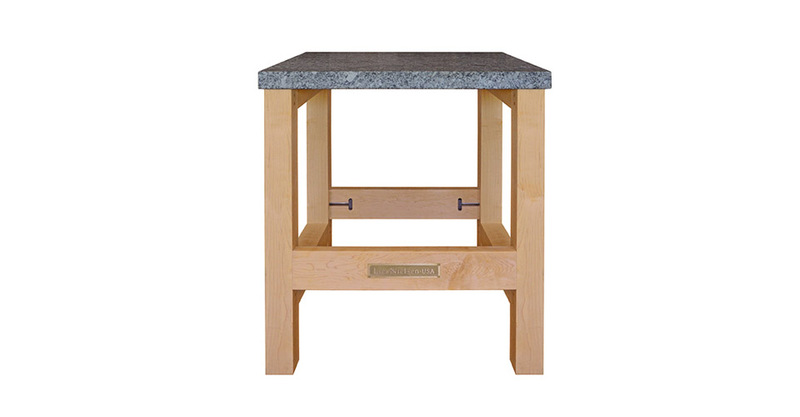 The Maine Granite Sharpening Station features simple design and solid construction. The tresles are made of Hard Maple, a native hardwood that is stable, heavy and tough. Polished Maine granite top is 2" thick and milled flat to .001" in 6".